* New Kazuo Ishiguro, Nocturnes: Five Stories of Music and Nightfall , which is a cycle of short stories, a format I love. Neither of those are out yet, and as always when it comes to books, my eyes are bigger than my stomach (bigger than my bookshelves, maybe?) so I have lots from last year, and from Christmas to tackle. 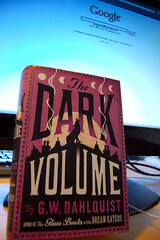 I’ve decided to start with a book called The Dark Volume; it’s the sequel to ‘The Glass Books of the Dream Eaters’, which I read at the end of 2006; although I ended up criticising it for pretty much the same reasons as everyone else – it was too baggy, needed an edit, the good guys never seemed to ever get on top of the bad guys, it was tricky to tell what motivated the heroes – I was grabbed by the first few pages of the sequel. Although it’s still the kind of book you could whallop a burgler with, and be safe in the knowledge he’d never get up, it was obvious from the first few pages the editing was tighter. Secondly, I don’t often read sequels or serials and I can’t deny it was nice to get that sense of familiarity from re-meeting characters. Finally, having survived hundred of pages of machinations in the Glass Books, the three heroes have motivation now: revenge. After that, the road ahead is less clear. I need to read a book called Rogue Leaders, which is a history of LucasArts games – shouldn’t take too long as it’s filled with a lot of illustrations. 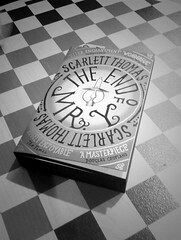 Then I’ve got Scarlett Thomas’ The End of Mr Y – you’ll recognise it if you’ve been into Waterstone’s recently, as it has black-edged pages. Plugged on the back by Coupland and Pullman it looks like a good mysetry with some pop-philosophy thrown in. In keeping with pretty much the only tradition I keep , there will now follow a list of the books I’ve read this year, with short reviews, and even shorter star ratings. 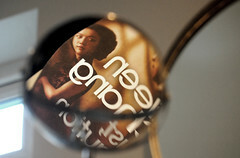 This year I’m going to photograph all the books I read in a suitable location/situation as well: 2009 cover project. Previously: Books from 2005 and 2006, 2007, and 2008. 5th January – 11th January. The Dark Volume, G W Dahlquist. (Amazon) Sequel to ‘The Glass Books of the Dream Eaters’, and far better – pacier, more focussed and meaner, it’s a breathless charge through a weird steampunk adventure that holds the attention and this time round, probably does give 24 a run for its money. 12th January – 26th January. The End of Mr Y, Scarlett Thomas. (Amazon ) Full review here. 27th January – 12th February. 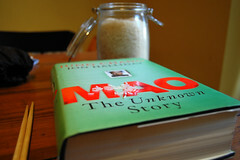 Mao: The Unknown Story, Jung Chang and Jon Halliday. (Amazon ) Controversial one this… In many ways, it really isn’t that good. I didn’t have such a problem with its combative take on its subject, declaring him guilty of being responsible for 70million deaths in peacetime, but most frustrating for the general reader is that this approach clearly sets out to contrast with (Chinese) establishment views of Mao, and yet there’s little in the way of context. Reading it feels like listening to one side of an argument. The history itself is fascinating, horrific and bizarre but the telling is a letdown. 13th February – 24th Feburary. Lust, Caution, Eileen Chang. (Amazon ) Lust, Caution is actually a short story, so it’s partnered by four others in this book. It’s worth the price of admission for the title story alone, which is a stunning piece of work that compressess a lifetime of obsessions, thoughts and feelings into a few short pages. 7th – 8th March. Watchmen, Alan Moore and Dave Gibbons. (Amazon ) Geek confession: I’d never read Watchmen up until now; blitzed through it one weekend in preparation for seeing the film. I loved how formally inventive it was – parallel stories, shifting timelines, invented documentary sources – and the characters are compelling. The impending nuclear doom backdrop never quite gelled with the rest of the story for me, though. It seemed like a real product of its time, out of step with how things are now and not convincing enough to transport you back to a time when the danger was real. 25th February – 20th March. The Last Summer of the World, Emily Mitchell. (Amazon ) Fictional account of pioneering American photographer Edward Steichen, who lived in France just before the First World War. The plot – rendered somewhat predictable by the flashback structure – is about the disintegration of Steichen’s first marriage, but it touches on a lot of affecting things; photography and memory, the challenges war poses to visions of creativity, Americans in Paris… Comes together beautifully in the end. It may be understated but it’s a compelling and haunting piece of work. I’m surprised it didn’t get more attention from the press and awards types. 21st March – 30th April. A Thousand Years of Good Prayers, Yiyun Li. (Amazon ) Highly praised (as in ‘she’s as good as Chekov’) book of short stories set in contemporary China that I just completely and utterly failed to get in to. 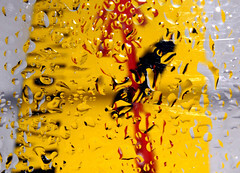 No idea why – maybe my own frame of mind at the time – but I just couldn’t get very far with it at all. 1st April – 29th April. The Sparrow, Mary Doria Russell. (Amazon ) Feted by io9 as one of the 20 Science Fiction Novels That Will Change Your Life, The Sparrow certainly has an excellent premise: a radio telescope picks up haunting alien songs, and while the UN dithers about what to do, the Catholic church steals a march and despatches a ship full of Jesuits (and their friends, thanks to some plot ropey contrivances) to see what’s going on. Things go horribly, horribly wrong, and only one person makes it back. The narrative is divided between the investigation into the expedition and the expedition itself; hard not to feel disappointed because everything appears tuned to make the awful acts of the denouement seem as terrible as possible. Great ending, but you’ve got 500-odd pages of overwritten prose to wade through to get there. 30th April. Chess (aka The Royal Game), Stefan Zweig. (Amazon ) Brief but compelling novella written in the 1940s by an exiled Austrian Jew; it works as an allegory about power, but also as a driving, mysterious story about two adversaries at chess. 1st May – 28th May. The Wind-Up Bird Chronicle, Haruki Murakami. Easily the best thing I’ve read all year. An amazing book. 29th May – 7th June. The Housekeeper and The Professor, Yoko Ogawa. A very short novel about the relationship between a housekeeper and a genius maths professor who has only 80 minutes of memory thanks to an accident; sounds cliched, but some wonderfully delicate, ambivalent and detailed scenes bring the relationship to life. Only the slightly flat ending lets it down. 8th June – 16th June. Red Dust, Ma Jian. 17th June – 2nd July. High Rise, JG Ballard. Fascinating concept – the inhabitants of a high-rise building become cut off from the real world, and the physical deterioration of the high-rise mirrors their moral collapse. Sadly it’s dull to read, with little in the way of shades of grey, stiff characters and not enough plot to sustain it. July. The Brief Wondrous Life of Oscar Wao, Junot Diaz. A brilliant read by a terrific writer, the story of a Dominican geek and the curse on his family. July. The Ghost, Robert Harris. Entertaining thriller. August. Bartelby the Scrivener, Herman Melville. Superbly creepy. Ending unfilling, though. August. Another Bloody Love Letter, Anthony Loyd. Second volume of autobiography from war correspondent/on-off heroin addict. Exciting and bleak to the point of nihilism, yet grounded in flesh and blood love and loss. His attempts to deal with the death of a friend are moving and insane in equal measure. 27th August – 31st August. In The Miso Soup, Ryu Murakami. 11th – 15th September. Nobody Move, Denis Johnson. Brilliant dialogue, but the plot is pointless and the characters are weak. 16th – 23rd September. Shout! The Beatles in their time, Philip Norman. Outdated – the bulk of the book was written in 1980 – with a rushed update chapter and a prologue with portentous, cheesy 9/11 references, it’s unfair to Paul and George, infatuated with John and lacks rigour (and interest) in the music. 25th September – 3rd October. 20,000 Leagues Under the Sea, Jules Verne. 4th October – 17th October. The Blind Side, Michael Lewis. Terrific story telling. 17th October. The Road, Cormac McCarthy. Terrifying and hugely affecting. 25th October – 9th December. Await Your Reply, Dan Chaon. Following The Road was always going to be tough, and despite the fact it’s a book that’s featured on many ‘Best of 2009′ lists, Await Your Reply, a literary thriller about identity theft, was still something of a let down. I blame the turgid first half; three (apparently) unrelated sequences that of drifting, endlessly passive characters with no real purchase on the world. When the book kicks into gear, it is terrific, at least for a little while, Chaon managing to remove the bottom from the characters’ world and let them fall a long way. As good as this part is, it struggles, like so many modern books, to end, and mostly fritters away the menace and meaning of these highlights. 9th December – 30th December. The Age of Wonder, Richard Holmes.